Let's get a fleet of Greyhound busses and ship them out! Last edited by RonnieinDallas; 04-07-2014 at 10:20 PM..
Read the amendment. It's a joke and the idiots of 8 had their fingers in it... Voters need to get rid of Rubio and quick. I still like my sniper every 500 yards idea. After a couple 1000 heads explode they'll get the idea and illegal immigration "will be a thing of the past". No fence will keep out people who are willing to enter illegally. E-verify, no amnesty, jail and fine employers. It will need to be a big fine. That million+ fine didn't stop Pappas restaurants or Shipley donuts. I'll bet half the houses built in Texas in the last 20 years were built by undocumented. A double layered wall (like congress approved but didn't fund) in the most porous areas will certainly cut illegal immigration back immensely. The 30 some miles of it in the San Diego sector did just that. I agree that we need to take the other steps that you suggested also along with denying benefits and birthright citizenship to their kids born on our soil. They aren't undocumented. They are illegal aliens and I know of many tracts of homes built by them here in California and the workmanship was shoddy. They built the fence moving east. What happened when the fence stopped. They cross where it's easy. Build a fence, they'll go around it or dig a tunnel. If I needed work to feed my kids, I'd cross, too. Let the church who teaches birth control is a sin sell some stuff and start providing jobs in Mexico and Central America. The fence wont stop all. But it will funnel them to other areas. That means more able to predict points of entry. Why watch 1200 miles of border if you can reduce it to 600 miles or less. I agree hammer the greedy employers and that includes Joe cheapskate trolling the home depot parking lots. Exactly. They cross at fewer points and we can predict where. 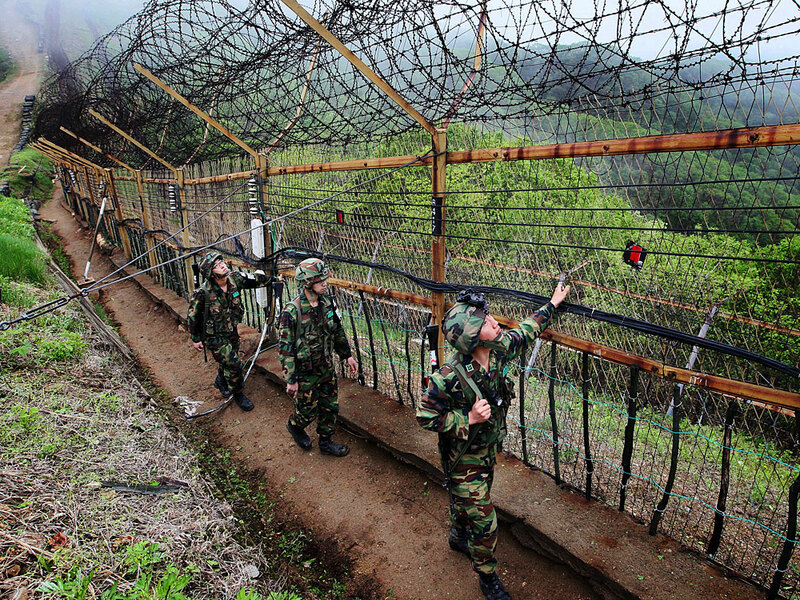 Fences can be fitted with sensors that detect tunneling activity. Here is an Idea. Their problems their kids their issues. Not our problem. We should be seizing the assets of all illegals caught to help offset the cost of their deportation. Nope, the premise is that where there is no wall the Border Patrol can focus their efforts there. We were supposed to get 700 miles of the double layered wall but congress didn't fund it after approving it. There are tunnel sensors also that can be used. They aren't coming here to feed their kids. They can do that at home. It is just that they can make more money here and we offer all kinds of welfare handouts especially if they give birth on our soil. Irregardless, what about Americans needing to feed their kids? Many Americans have been put out of work by illegals and had their taxes go through the roof covering their social costs. What gives these people the right to break laws for their own selfish reasons without any consideration for Americans and their families?